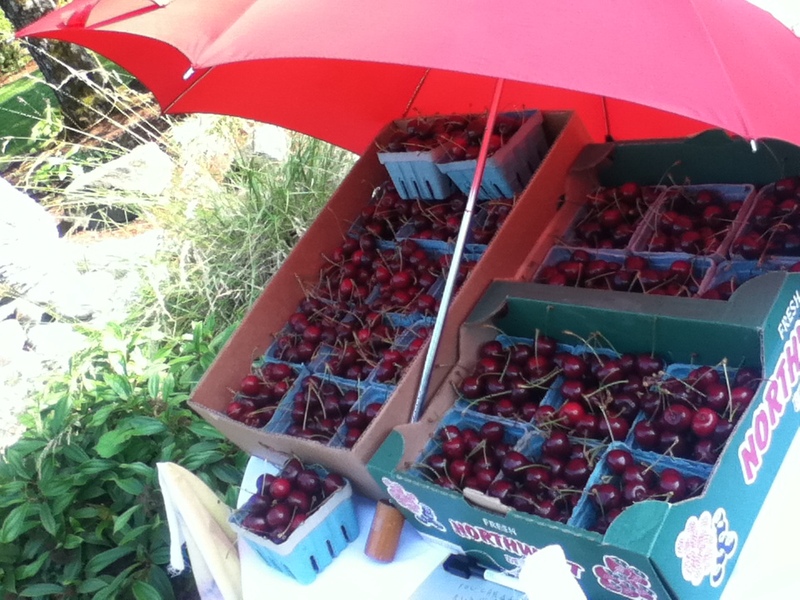 An umbrella to shade the heat-swollen cherries. Here in the stone fruit-and-berry rich Pacific Northwest, kids sell cherries freshly picked from their backyard trees in lieu of having a lemonade stand. At least on our street in Corvallis, they do. These are not the crappy, under-ripe and non-organic Hood River ones sold along the highway on the Oregon Coast last week. These are ripe, beautiful, juicy, seemingly chemical-free Bings. The organic Raniers grown under high tunnels on the OSU research farm. 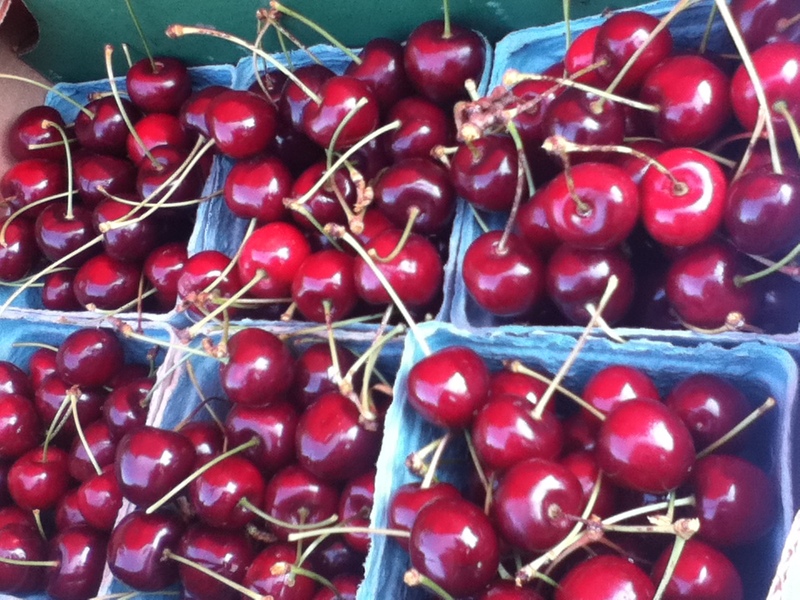 Apparently, and based on the neighbor’s harvest, Oregon is having a bountiful, if delayed, cherry season this summer. Often, the constant spring rains will force many blossoms to drop before pollination. They seemed to fare better this year. Giant organic Ranier cherries especially flourish, when protected and heated up by high tunnels, on an OSU research farm here. No, you can’t take them with you. Please don’t accuse us of hoarding cherries. Freezing them won’t do this year. I’m also liberated from canning. Now it’s time to make clafouti, or brandied cherries, or the bing cherry-rhubarb brown betty I discovered our first summer here. That was the first year I bought the neighbor’s crop. Apparently, the young boys have doubled their asking price since four years ago. That seems fair. It’s a self-serve stand operating under the honor system. There’s something hopeful, and of course entrepreneurial, about young boys holding a cherry (or even lemonade) stand. These boys work for their allowance. Their mother also has them play their fiddles for change sometimes at the farmer’s market. 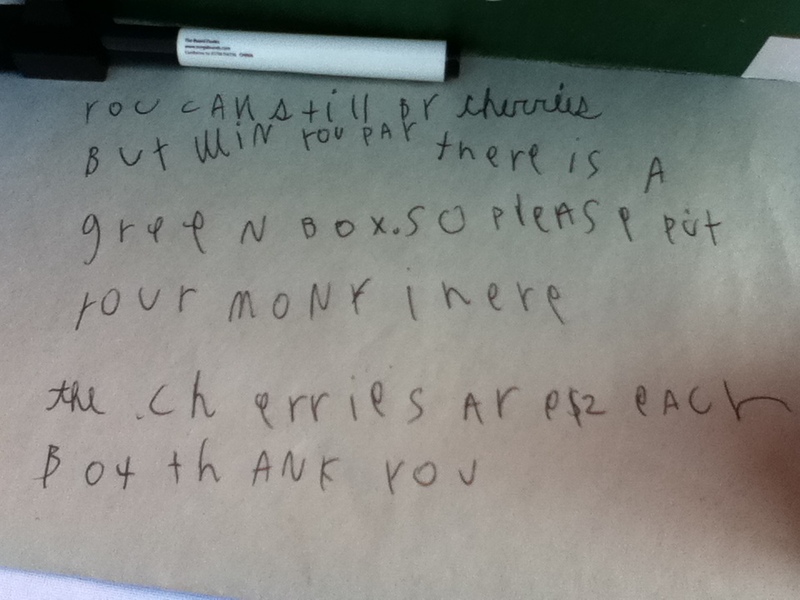 So mothers begin to instruct their sons to make a buck the honest way. Sure going to miss the berries and cherries just highlighted in this ODA report, “Oregon contributes heavily to nation’s fruit basket: http://oregon.gov/ODA/Pages/news/120711fruit.aspx. 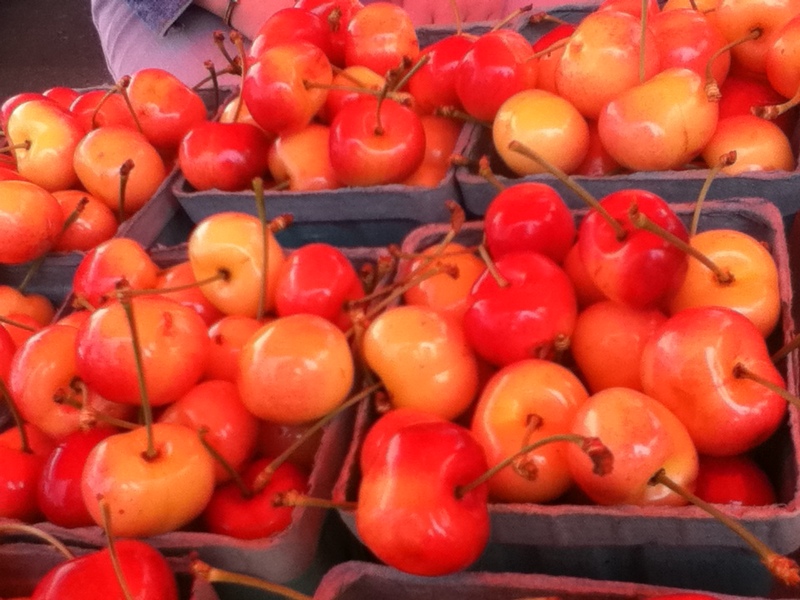 We’re the third biggest sweet cherry producer in the U.S., behind Washington and California. We produce virtually all of the nation’s commercial hazelnuts, black raspberries, blackberries (including iconic Marionberries), and boysenberries. And blueberry production–also the U.S.’s third biggest producer–hit record levels last year. Take that, Maine! But to clarify, our new home is more famous for its lowbush, “wild” blueberries.